I did my MBA at Cambridge University, it was funded by my employer, I don’t regret it and it’s probably got my foot in the door for a variety of jobs. Would I have self funded? Absolutely not! In my my experience of work, and getting jobs, it’s who you know rather than what you know. I’ve become an excellent networker and that’s what’s got me where I wanted to go. Becoming a great communicator, learn how to present yourself and look successful breads success and opens doors. Hi Jonathan, thanks for sharing your story. The MBA opened doors to me also, but as you say, it is who you know and not what you know. Someone can become an amazing networker as you did without the need of paying 50k a year for someone else to build a randomized network for her or him… that way that person won’t need to pay 50k next time she needs to build a network around a specific project! I like the way you point out things there, and I can’t help but agree with you on them. Being an MBA is a great achievement, but if you get yourself in debt just so that you can be one, then it may not be a great decision on your part. I personally think people who attend graduate school are wasting there money because they’re just there to be recognized, and there’s a chance that they may no learn anything new there, but they are still required to pay. The increasingly competitive job market has increased many employers’ requirements for applying to a position. For many of us, they won’t even consider you without an MBA even for lower level positions that never required one just a few short years ago. What is one to do when then? Hi Adrian, thanks for your comment, though I don’t think it is accurate. 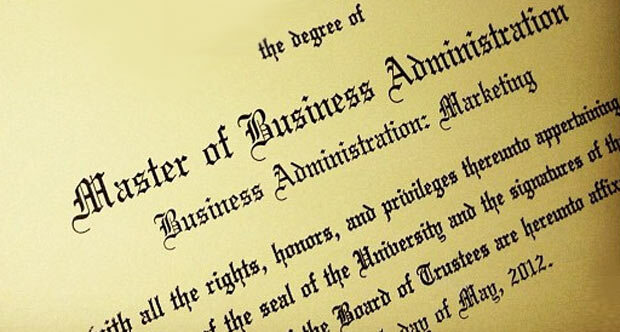 Most employers just need someone to solve their problems and will just look for the key skills they need, while a few of them (very few, in fact) may use the MBA degree as a screen for resume selection. About 80% of jobs are filled in the hidden market; for the remaining 20% of jobs offers that are published, the winning skills are those that are rare and have high demand… an MBA does not qualify as a winning bullet in your resume. So I would recommend two things: First is to count on the advice of labor market experts instead of simply believing what the marketing statements of business schools say. Second one is to invest in identifying the key skills your market demands and develop those skills, which will be a winning strategy, instead of mortgaging your future to invest in a tie-breaking strategy that would apply only to 5% of the cases. I am so sorry for your loss. Pursuing an MBA demands an incredible personal effort that can have consequences to your health and it has definitely an impact in your personal life. Of course, I am not saying that there was a cause-effect rapport in your husband’s case because I have no proof there was, but I assure you that the 90 to 100 hours-study-weeks I went through during the program were not worth the effort to me. I lost precious time with my family and friends, and when you face such a sad event as you did, I cannot see the point. Thanks for sharing your story. Sorry for your loss Janie. A degree is useful, no guarantee. The part of financing expensive degrees is going to reduce, market forces will work. Any degree should be pay as you go (follow Dave Ramsey). I got an MBA in 1989 from local university, while living with parents. That $10K loan was bad enough to pay. I would not do the debt degree from a big expensive name. Not worth it. I think a graduate degree is worth it IF it gives you skills you did not already possess, and access to career options you otherwise would not have had. I’m in the middle of a masters degree in GIS. I did not possess GIS skills prior to entering this program. Getting the degree also will open up a lot of career options I wouldn’t have had previously – it’s a very diverse field and I can probably find a GIS-related job almost anywhere. So – it’s a lot of work – but yeah, I think it’ll be worthwhile. I’d also considered a degree in something like international relations – but my undergrad was in international studies and part of my career has been in that area, so while I’d definitely learn some stuff (I’m not discounting that at all! ), it wouldn’t give me that much more in terms of marketable skills or career options. If an employer were willing to pay my way for an MBA, I would absolutely go. Otherwise, it doesn’t make sense for me. I’ve worked too hard to stay debt free! I’ve been wanting to go to grad school pretty much since I got my Bachelor’s. I wanted to take a few years off first in order to gain some work experience and figure out what I really wanted. 7 years later and I still haven’t gone back, and now I’m not sure I’m going to. While I feel like I would personally gain something from continuing my education, I don’t feel like the debt is worth it. If my employer was willing to pay for it, I would go back to school in a heartbeat! For now, I’ve taken some “continuing education” classes that my university offers; they are specialty programs for working professionals to learn new skills and stay up to date on changing technologies. It is much cheaper than a Master’s, and it still looks good on a resume! I think it depends on your field. In education, master’s degrees open up your marketability and are required for teaching at the college level. I have taught in Washington State for a number of years and Japan on the JET ( Japan Exchange and Teaching) Program. I learned that if you want to teach English overseas outside of special programs such as JET or the Peace Corps AND you want it to be your career, you really need to have an MA in TESOL. You can work in small conversation schools and make decent money, but you will work long hours under sometimes questionable conditions. It is fun for a while, but not a good long-term teaching career. Public school teachers also benefit from a master’s degree as most states’ continuing education requirements demand as many hours as a master’s degree. It makes more sense to put your money that you have to spend anyway on a degree, and move up the state salary schedule. No- it won’t actually pay for itself, but if you have to do the hours any way, and no one is going to reimburse you, why not? I would advise all teachers or those in the public sector to go for state schools ( no Ivy League here!) and choose the master’s degree that best fits your specialty. I agree with you Matt, any training is worth IF it gives you rare and demanded skills that can help employers solve their problems. A friend of mine works in the construction sector, where corrosion started to be an issue. While many people go into massive debt to get a master’s degree, he pursued a 3k training on corrosion and he receives new job offers every moth. People with his profile earn six figures in the US. People need to understand that old formulas are not working anymore. I was of the same mind for the longest time. I really did not see myself progressing in my field of archaeology as a life career. But then I found a great company to work for that reignited my passion, and offers a 50 percent tution reimbursement. In archaeology, to climb to the rank of project manager, you have to be a Registered Professional Archaeologist (RPA). To jooin the RPA , you have to be a have a graduate degree. So I found a great distance learning program in Archaeology and Heritage Management in Leicester, UK, and am trying to balance full time work and school. No husband or kids, so it really is the perfect time in my life to do so. I’m glad I waited until the stars aligned. I almost went right out of undergrad, with no purpose other than to go, and THAT would have been a waste of money and brain space. Kristina, My son graduated in May with a degree in archaeology and he did not get into grad school on the first try. He’s reapplying, but in the meantime he has applied for entry level jobs on line as a field tech or a lab tech, but no luck so far. I would appreciate any suggestions for what he should do at this point to start his career. His main area of interest is zooarchaeology and he’s very knowledgable. He worked in the zooarch lab at school and did a zooarch field school. I had no intention of ever going back to school after getting my bachelor’s (in secondary education) but I realized after getting married that the only way for me to advance in education was with a Master’s. I went back to be an administrator, hated it and then decided to get my master’s degree in counseling and get a LPC. This decision was profoundly life changing because it gave me the opportunity to explore a different but related field and it helped me gain licensure so that I can work independently as a private practitioner if I ever want to leave schools. A grad degree can be a great investment if it allows you other opportunities you might not otherwise have. However, if you can still educate yourself and find a foot in the door without the cost of grad school, it’s a no brainer what the choice should be. Nice article I just made my last student loan payment for my MBA today. It cost me 38K and took me 6 years to pay off. Ironically I am actually making $200 less than when I graduated (thank you horrible job market. If I could have done it all over again I often wonder if I would. Yes, the MBA definitely is losing its luster as well as responsible for putting many students deep in debt before even graduating. It does hold some merit, but not effective as it once was. Would be better off educating yourself financially and working to obtain true financial freedom. Unfortunately for most teachers, graduate school is a must if you want to get a raise. You cap out on the salary schedule after about five or six years and the only way to continue to receive raises from year to year is if you have a master’s degree. For some of us, it isn’t a choice. Hi Sarah, thank you for your comment. I understand what your analysis of the situation is. As I don’t know your particular industry or profession, I will assume that you are right, but I really don’t believe there is no choice. First, this is not the case in most situations; what really happens is that most people don’t understand what makes their employer give them a raise. They believe that better credentials are the only way to get that raise, but most often it is not true. But as I said, let’s assume that this is true in your particular career situation. This does not mean that you should pay any price to get that raise! You cannot argue or talk your way into a raise in the world of education. Salary schedules are created by school districts and state governments. The only way to move around the salary schedule is by years of experience and what level your degree is (bachelor’s, masters, or doctorate). Once you cap out, you cap out. You will NEVER see a raise unless they change the salary schedule or you move up. For example, after six years with just my bachelor’s degree I would never make more than $37,000 a year. That’s it. There is no opportunity for raises unless I got my master’s degree, at that point I would continue to receive raises for another 10-15 years until I got my doctorate. It isn’t a matter of not understanding HOW to ask for a raise, it is because you CAN’T. Try and they look at you like you are an idiot and refer you the salary schedule. You want a raise after capping out? Go back to school, that is YOUR only choice – unless you choose to move to another school district that may pay more and in some cases, school districts don’t take into account your years of service. I see what you mean, Sarah, I understand your situation. Not all career situations are the same, though. I invite anyone considering a master’s to deeply analyze if it is really worth. May be you already came to the conclusion that it is worth in your case, and, of course, I respect and understand that! Good luck! Thanks for this timely article. I’ve been debating for the last few weeks whether or not to pursue a Post Graduate Certificate (I already have a Master’s Degree) but I am retooling in an effort to change careers. A Certificate costs much less than a full MA program, but it is still quite expensive, especially for someone who’s previous student loans are not paid off! Your comment: “… any training is worth IF it gives you rare and demanded skills that can help employers solve their problems.” Totally just changed my mindset about how to attain the skill set I see employers asking for in the job listings I’m interested in. Thanks to that nugget of wisdom and a couple of quick Google searches I have another plan that will potentially save me $$$ and time! That’s great Lynnette! That is exactly my point: A mindset change! I am so happy that it helped you see where the real value is! I am in Canada and got my MBA 13 years ago in the middle of Internet 1.0 collapsing. My degree came after two years of gruelling work and a ton of debt. I would do it again in a heartbeat. Companies which would not even acknowledge receiving my resume before the degree were on campus recruiting regularly. I had three offers for my summer internship, turned them all down flew out to San Fran not knowing a soul in the world there (2000) and got a full-time job, a contract writing job and a consulting job for the three months of my vacation. When you are young you can sleep 4 hours a night. When I left SF to return for my second year of the program, I had a job offer in my pocket. Company sold over night, the executives transferred to the new one, and my offer still stood. The company got sold again to a completely new owner, a month before my graduation in spring 2001 and this time my offer was gone. I called one of the Fortune 50 employers whose internship offer I had turned down the summer before, I called a Swiss university whom I had only corresponded with the previous summer and in a month I had two job offers. To anyone who thinks I could have done any of these things without the MBA program, I say you are wrong. Did my negotiating skills pay off? Of course… I was more aggressive and gutsy than most. But guess what, some of that confidence was born in the program, and I seriously doubt I would have looked at a marketing VP in the eye before and argued that I was worth more $ than they paid all my other colleagues. So – as someone who was on both sides of the interview (went recruiting later on) the MBA degree matters. With the caveat that it is a quality, prestigious program. The fact that you made it in and hold your own and have the grades to show for it reflects a lot of qualities. Plus, for some companies, they will not even talk to you or consider you for a senior position, without the degree. No idea what recruiting looks like now, but even after graduation I was headhunted and offered positions no matter how tough the market was. Oh, and my starting salary was more than double what I made before. Got raises and promotions annually afterwards. Would this apply universally? Maybe not, but for me it was the best decision I ever made. I got the idea of pursuing MBA through the “everyone-is-doing-it” pressure. I have 4 yrs experience in Telecom Industry and I became an engineer because of the “everyone-is-doing-it” pressure. I toiled and worked hard appeared for GMAT , prepared essays , read business magazines , and read a lot of articles. After so much effort I got in. But , during this journey I learned a lot about business and I came across books like the Personal MBA by Josh Kaufman and many more. I realized that 95% of the things which are taught in B-school are available for free or just for a fraction of the fees the B-schools charge for !! This really turned my situation upside down. And for someone who wants to start his/her own business , going to a B-school doesn’t make any sense at all. All this reading really challenged my beliefs and I really asked the question to myself , ‘What do I really want do in life?’ and many things happened (including watching the movie ‘Into the Wild’ which really motivated me to do something which makes me happy). I tried many things and I realized nothing made me more happy then helping and guiding children. So , I decided to pursue a master’s in counseling. I think it is one of the best decisions I ever made in my life and It took a lot of courage from me to leave my B-school. When I read your post I feel I made the right choice (you can never be 100% sure though 😉 ) but it really makes me happy. So , all in all I can say that preparing for MBA really took me to my right path , so it was not a waste of time after all . I have been telling many more children and friends to pursue their dreams not just do something because of the “everyone-is-doing-it” pressure. Thank you for your wonderful post and hope you can keep spread the message and I will try to do the same as well. first of all thanks for this great piece of advice to all the people who is running after the so called “Dream MBA thing” .. I am also looking forward to hone up my skills by doing MBA from a top institute.. I was preparing for IT but yes In India too there are many millions of MBAs who are doing the same job what a graduate can also do if traineed.. yes with a little higher salary tough… but that 2 years of time and money…. specially that opportunity cost which no one knows what offers that one would have got from other company during the time of his MBA… I am working In retail bank sector in India where I need to face a lot of customers and solve their query….Need to build a good rapport with my clients.. as you know what a banker does.. I have finance knowledge from what I read from books and the practical knowledge..But here is one concern that I want to share with you, I want to make a life in the banking sector mainly in the interest because I like being around people.. If I don’t do an MBA so what masters will suite my profession… any good recognized distance learning programme/certification you can suggest me which will bring a weight to my CV..(though I know that will not put me up in jobs…but just want to show my employer that I am good at handling my clients and have a good banking and finance knowledge),… so that when they want to ask me then they will be more inclined towards asking me questions on what I will like them to show…..
any suggestion regarding my job and my personality…. a customer service officer in a bank who loves to help people and want to be very expert in dealing with my clients……. I like how you point out that it really doesn’t matter what kind of education you receive. Ultimately it depends on how you connect with people, how you communicate, and how you carry your self daily. Starting small and working to strive towards something big is important. Having discipline is great but you need to also have a destination in mind. We live in an information age now. We also have tons of people out there who think that the “American Dream” will be well on its way once you go to school and get good grades. Leading to a great job or career that you love. I know for me that’s what I thought and once I was done with college, things haven’t fallen into place. At least not yet. Going to school is great and I wouldn’t change that, however I would change my mind set going into school. As well as what I would do while I was in school and continue to do afterwords. I feel like for the first 20+ years in our lives it’s all about getting good grade and following and doing exactly what we are told. Memorizing, regurgitating information, and doing things based on what someone else wants us to do. And doing so with minimal failures. Because what does failing mean in school? Bad grades!! Nobody wants to go to school and get bad grades. So we get good grades and we never really learn things the hard way, by failures. Multiple failures makes us really learn what we need to do to make us who we are and to make us happy. >>I feel like for the first 20+ years in our lives it’s all about getting good grade and following and doing exactly what we are told. Memorizing, regurgitating information, and doing things based on what someone else wants us to do. Zack, there is blame to be put on the system of education, but it’s also the student’s job to question, to be curious and to make the connections between study and real world applications. Unless you just sat there and “took it” without much thought into what is being taught, and you now realize that your education was stale and unchallenging because of this lack of initiative then you’re basically taking your disappointment is misguided. The last time I heard an MBA curriculum isn’t the same as high school or undergrad curriculum. And yes, getting good grades is a good thing. What’s even better if you got the good grades because you understood the concepts and how, if they do, apply to the real world and human thought. It’s a scam to keep the middle class/sheeples further in debt and keep colleges/university personnel employed. Companies just end up sponsoring visas to bring in highly educated foreign workers who are willing to work hard and earn less than what their MBA should garner for them. My rantings may seem highfalutin … but I highly doubt it’s far from the current reality. I tell people and my own kids to earn college degrees … then stop short of there! Seriously ask yourself if you’re willing to go much more deeper in debt for something that stops short of looking good on paper/resume. I appreciate that the university system in the US is (probably), quite a bit different to the system here in Australia, particularly related to cost (where I believe the fees are significantly higher), but I am very surprised by the negativity of this article and most of the subsequent comments. The other disappointing aspect is the obsession with money and earning power – what about the learnings? Having just completed my MBA I have to say that it was one of the most rewarding experiences of my life. I’ll accept that I and my situation is maybe a little different to most MBA graduates; I didn’t go to university after leaving school and thus do not have a under-graduate degree; I enrolled as a mature student (36 yo); I’m not motivated by money and looking to be a million/billionaire or CEO and I learnt very soon after enrolling (but before commencing my first subject), that an MBA wasn’t going to get me a job, (a very valuable lesson). What I have got from the MBA (apart from my academic learnings), is confidence and a higher self-esteem; the courage to question and challenge even the most referenced and acclaimed theories and research; reasonable (ha! ), research skills; better writing skills and a greater understanding of Government and the business world. I agree that for some people, it is possible to obtain all of the attributes listed above and my learnings for free, with workplace experience and the internet; however I am not that type of person and I would argue that most people are the same. I would therefore strongly encourage anyone thinking of enrolling in the program, but before enrollment I would say to them this: ‘What are you hoping to get out of the degree?’ and ‘an MBA won’t get you a job, enjoy’.